Our Children's Worship Bulletins include biblically based Sunday school activities, that can be made into games about faith for kids ages 3-6 and ages 7-12. Pictures, mazes, codes or other puzzles are used to make learning about Scripture passages from the Old Testament, the Gospels and the Epistles fun. Each Children's Worship Bulletin has been professionally designed and reviewed for educational soundness. The quality and usability of each Children's Worship Bulletin is unmatched. What's more, you can use the activities in the bulletins to come up with your own interactive games to get your kids up and moving and engaged with Sunday school. 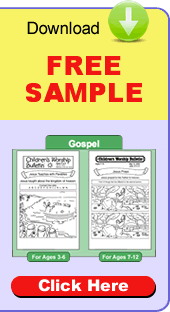 Print the Children's Worship Bulletin for Galatians 2:15-21, "Live for God". Explain the object of the game, "The goal is to be the team to find the most ways to live by your faith in Jesus as illustrated in this Children's Worship Bulletin." Read aloud Galatians 2:15-21 to reinforce the lesson. Print the "Faith is believing without seeing" page and answer key from the Children's Worship Bulletin website. Divide the class into teams of 2 or 3 members each. Explain the object of the game, "The goal is to be the first team to find all 5 letters spelling 'FAITH.'" Direct the teams as follows, "Find the letters 'F,' 'A,' 'I,' 'T,' and 'H' in the picture on the 'Faith is believing without seeing' page. Raise your hands when you have found all 5 letters in the picture." Read aloud Hebrews 11:1-3, 8-16 to reinforce the lesson. Sign up now for our 30-day Risk-Free trial offer! With Children's Worship Bulletins available for children ages 3-6 and ages 7-12, you're sure to find Sunday school games about faith for your students. But don't just take our word for it. Sign up for our 30-day, no obligation Risk-Free trial. For an entire month, download, print and share bulletins with your Sunday school group. If you're not completely satisfied, cancel and owe nothing. If you wish to continue, quarterly memberships cost just $12.95 per age group. Enjoy our new member special and SAVE 50% on the cost of your second age group for the first year. Don't delay. Sign-up today.